Leaders from 30 pregnancy resource centers around the United States met in Colorado Springs for week-long intensive that equipped and encouraged those on the front lines of the pro-life movement. COLORADO SPRINGS, Colo., Oct. 30, 2018 /Christian Newswire/ -- Non-profit ministry Save the Storks announced today that the first annual Flyway Intensive was a resounding success, with 30 executive directors from pregnancy resource centers across the United States in attendance. The week-long event was held at Garden of the Gods Club in Colorado Springs and was opened with a devotional by Jayde Duncan, Senior Pastor at Antioch Church in Colorado Springs. Break-out sessions featured mentors who coached the executive directors and helped craft actionable SMART goals specific to each PRC. The Intensive was the brainchild of Joe Baker, CEO and Founder of Save the Storks, after learning that a Flyway is a migratory formation birds take as a flock to help reach their destination in a more efficient manner. Joe was also inspired by the African Proverb "If you want to go fast, go alone. If you want to go far, go together." Motivational sessions from Peter Greer of HOPE International, culture expert and president of Colson Center for Christian Worldview John Stonestreet, radio host and Christian speaker Ryan Dobson, Paul Freed, managing partner of Herd Freed Hartz, and Bob Lenz, renowned Christian communicator, were just a few of the speakers at Flyway. 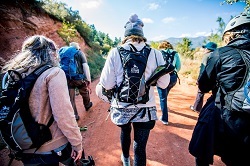 One of the team experiences was a memorable hiking and rock climbing outing, and the banquet at Glen Eyrie Castle featured speaker and best-selling author Stasi Eldridge. Attendees were told that each director would receive $300 towards airfare, and that one lucky executive director would find a $3,000 check under his or her chair. Much to everyone's surprise, each of the 30 executive directors received a $3,000 check! Individual funds and grants totaling $130,000 were given to help support pregnancy resource centers with everything from follow-up training to rebuilding after a devastating hurricane. Christine Moody, Executive Director with Coastal Pregnancy Care Center in Morehead City, North Carolina stated during the rock climb that "Joe (Baker) is taking us on a mountain top of success. And this mountain climbing is symbolic of that. And it does change you. You will never be the same." "I have been inspired and encouraged with you this week. You [Storks] are living a life worth following! Praise God!" Nick Emery, Executive Director, Life Choices in Carson City, Nevada. "At the Flyway Conference we hoped to provide restoration, hope and inspiration for those on the front lines of pregnancy center ministry," stated Shara Pierce, Director of Consulting at Save the Storks. "We brought in top experts in business, non-profit management, recruitment, client services, strategy and leadership, and each attendee received a shirt which included this version of a Maya Angelou quote: 'People will forget what you said. People will forget what you did. But people will never forget how you loved them.' We hope that these 30 remarkable directors will never forget the Flyway experience, and remember that they are loved and lifted up by everyone at Save the Storks." Save the Storks mission is to revolutionize the meaning of pro-life. This organization partners with pregnancy resource centers in the United States to empower women with choice during pregnancy. Save the Storks has captured the imagination of millions with their compelling Heartbeat and Father's Day videos and with its innovative fleet of Mercedes-Benz mobile medical units, known as Stork Buses. To date, Save the Storks has built 46 buses, with three additional Stork Buses in production and nine in fundraising. 79% of women say they weren't counseled on other options outside abortion. 64% of women who had abortions say they felt pressured by others to abort.